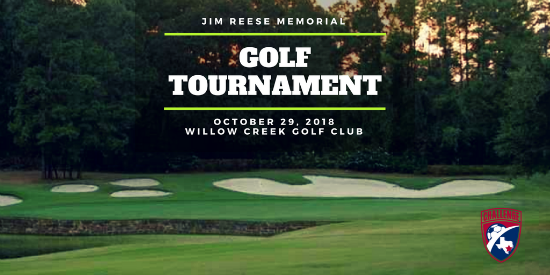 The 30th Annual Challenge Soccer Club - Jim Reese Memorial Golf Tournament is set for Monday, October 29, 2018. Challenge looks to extend this great tradition with a superb day filled with golf, friends and fun! The golf tournament is our largest fundraiser of the year so we hope you'll be able to join us. The money raised at the golf tournament is distributed two ways. Portions of the funds raised are used to offset soccer expenses for individual players who sign up golfers and sponsors. The money raised also supports the Jim Reese Fund which services the Financial Assistance Program. 2 Foursomes, Corporate Signage on 2 Tee Boxes, Longest Drive Sponsor, Monogrammed Pin Flag and Lunch. 1 Foursome, Corporate Signage on 1 Tee Box, Closest-to-Pin Sponsor, Monogrammed Pin Flag and Lunch. 1 Foursome, Monogrammed Pin Flag and Lunch. Includes Green Fees and Lunch for Four. Includes Green Fees and Lunch. Signage displayed on drink carts during entire event. How much money goes back to the player and how much goes to the Jim Reese Fund (JRF)? Please note, if your account is already paid in full before the golf tournament all monies raised can either be distributed to another family or to the Jim Reese Fund. We do not hold-over money for the following year or refund any portion of your club dues. Donate items to our raffle and auction! Items we are currently looking for, include but not limited to, sporting event tickets, concert tickets, gift cards for restaurants/spa/travel, gift baskets, golf equipment, etc. Contact Ashley Fendley-Frazier if you want to donate an item(s) at ashley.fendley@challengesoccer.com.